A new show opens at Adventure Theatre this weekend! Mark Twain’s timeless classic sweeps you down the mighty Mississippi as the irrepressible Huck Finn helps his friend Jim, a slave, escape to freedom at the mouth of the Ohio River. Touching and timeless, this tale of friendship against all odds is recreated for young audiences as two best friends demonstrate the power of changing the world. Recommended for all ages. All ages are welcome to this fun-filled day of activities and entertainment! Family Day is part of the Kennedy Center’s annual Lunar New Year festivities, this year celebrating the Year of the Pig with three days of festivities, including special events showcasing the arts and culture of China’s Guangdong Province. Catch a screening of Lego Movie 2: The Second Part, which will be playing at the American History Museum starting Friday. While you’re there, stop by the Superhero’s exhibit complete with George Reeves’s Superman costume from Adventures of Superman and Halle Berry’s Storm costume from X-Men. And don’t miss The BatMobile from Tim Burton’s film “Batman” parked right outside the Warner Bros. Theater. Homemade love is in the air at the National Postal Museum’s annual Valentine’s Day Card Workshop. We’ve attended this event several times, so I can tell you firsthand it’s one to love. They’ll have pretty papers and neat Valentine-themed supplies, all you need to bring is your creativity and eagerness for fun! For more about the museum, see this KFDC post. Head to the ImaginAsia Studio in the Sackler Gallery for an afternoon all about love and art. Enjoy a digital slideshow of images of love in Asian art, create Valentine’s Day cards using woodblock prints that say “love” in more than a dozen Asian languages, and fold heart-shaped origami. For all ages and adult companions. It’s not a Valentine’s Day activity, per se, but the timing of this festival focusing on chocolate isn’t a coincidence. Join the NMAI to celebrate one of the world’s most beloved foods. Enjoy tastings, cooking demonstrations, and hands-on activities while listening to songs played on a traditional wooden harp. Celebrate Valentine’s Day with the whole family and share the love a little early at this sweet event. There will be crafts, Valentine making, and story time, plus snacks for kids. The lunchtime event can be topped off with a bite to eat at one of the many restaurants close by or with a visit to Nook, Ballston Quarter’s new beautiful and minimalist play space where young families can learn and engage in a quality way. Love is in the air — and at places all around DC this weekend! Events and activities to celebrate Valentine’s Day range from story time and crafts to nature programs to tea time. And they’re sure to be especially sweet. This post has the scoop on all of them. We’re just about midway through winter, and Hillwood is celebrating with their annual La Chandeleur, also known as Crêpe Day, marking the halfway point between winter and spring. In France, families celebrate by eating crêpes, which are round and golden, like the springtime sun. Hillwood and Alliance Française de Washington invite families to celebrate the holiday in festive French fashion amidst Hillwood’s spectacular gardens, magnificent mansion, and exquisite French treasures. There will also be activities for all ages, with story times and crafts especially for children. February is Black History Month, and there are events and activities throughout the DC area to celebrate it. Museum programs (including an entire museum! ), special tours and exhibits, story time sessions, and more will be enlightening and fun for all ages. See where they’re all happening here. * This weekend is the final chance to see The Velveteen Rabbit at The Puppet Co.
Matchbox is celebrating National Pizza Day by offering a Kids Pizza Party on Saturday at multiple locations. The hands-on classes will please any small chef! The session includes a chef hat, crayons, and coloring page; a tour of the kitchen and pizza ovens, a pizza class where each child will make a customized personal pizza, and a round of complimentary mimosas for the adults. Recommended for ages 5-12. Make your own mini version of visionary artist Andrew Logan’s Cosmic Galaxy Egg, a fan favorite of our permanent collection. Decorate your egg with sparkly bits and other shiny bling! This is part of AVAM’s monthly series of hands-on, drop-in, art workshops. Supplies and boundless inspiration provided! Get a first look and enjoy a fun activity at a new creative space for art and music classes! Makeshift is hosting an open house and Valentines Craft Party this Sunday. Meet instructors and create a pop-up card, treasure box, or ribbon wall hanging during a free Valentines craft workshop. This event is for all ages. Makeshift is located just off H Street NE at 1321 Linden Ct NE, behind The Atlas theater. This Black History celebration will feature musical performances, children’s activities, workshops, and entertainment for the entire family. Enjoy shows from regular favorites, including warm and engaging greeter and storyteller, Baba-C, and the always-popular Culture Queen, Jessica Smith. Activities will include mask making, face painting, a caricaturist, a make-and-take pottery workshop, and a STEAM workshop. Put some play in your Sunday afternoon with Let’s Play Takoma and the Takoma Park Recreation Department. The variety of indoor festivities includes board games and crafts, dancing, live entertainment, and many more hands-on activities for all ages. Join Ari Isaacman Bevacqua, yoga teacher and mom to an 8-year-old for a Spider-Man yoga class inspired by practice with her son and the fantastic new Spider-Man: Into the Spiderverse movie. Get ready for Spider-Man style moves and music from the movie’s soundtrack during the 45-minute long class. All levels of vinyasa poses, opportunities for partner yoga, and a relaxing savasana meditation at the end will be included. All children must attend with at least one parent or guardian. Reserve your spots in advance! Welcome, Year of the Pig! On Sunday, the annual Chinese New Year Parade brings vibrant tradition to downtown DC. 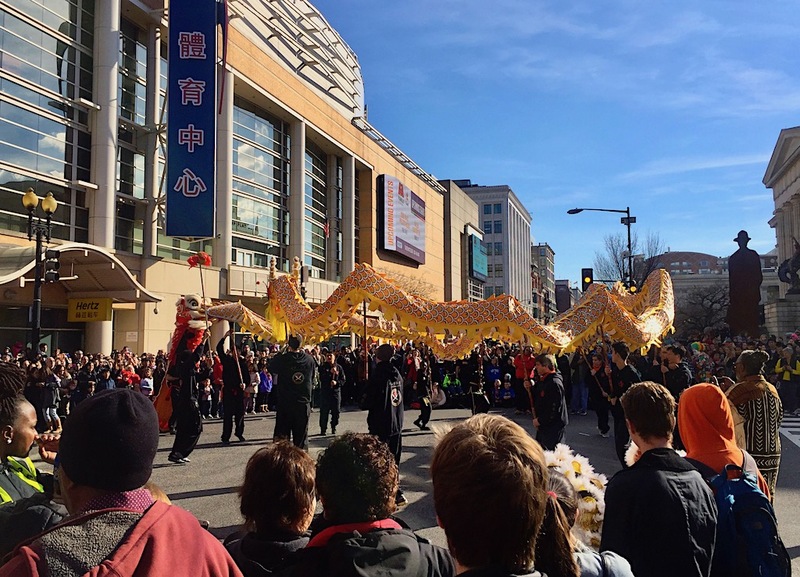 Festivities kick off at 6th & I Streets NW at 2pm and will wind through the streets of Chinatown celebrating Chinese culture in a brilliant procession that includes traditional dance, music, and, of course, the iconic lions and dragons. Kids always love seeing the show and having trinkets and treats given to them by parade participants passing by (mine really dig this!). The parade lasts about two hours, and spectating is free. Get there a little early to stake out your curbside spot — lots of folks come out for this one, especially if it’s a nice day. InterAct Story Theatre’s Wheaton Family Theatre Series continues on a special day and time this Sunday with a FREE afternoon of theatre and arts for kids. Artistic Director Ali Oliver-Krueger will lead kids and adults in an interactive Literacy Fiesta, bringing new stories for February to life through creative drama. Join them and beat the winter blues acting, singing, and dancing through favorite folk tales to chase the chills away! In these interactive workshops, kids and adults work together to explore a folk tale or children’s story, act out the stories in our own words, and maybe even make up stories of our own! * There’s a brand new post up about the Observation Deck at CEB Tower, which offers incredible views of the DC area plus cool experiences to enjoy them! * Two great giveaways are currently running, for tickets to Finding Neverland at National Theatre and the Big Apple Circus at National Harbor! * During the month of February, Lyft is offering one free ride up to $10 using code BHMDCA19 to local black history museums in our community, including the National Museum of African American History and Culture, the Anacostia Community Museum, and the Alexandria Black History Museum. * Books from Birth, the wonderful program started by DC Councilmember Charles Allen that sends children up to age 5 a free book per month, just celebrated its 3rd anniversary. * Looking for a good family flick? We really enjoyed the documentary Science Fair. You are a GODSEND, for the past 18 months I’ve waited anxiously every Friday for this post to come out and I’ve never once been disappointed, you are a critical component of my parenting experience and I could never thank you enough! Aw… this comment is thanks enough. 😊Have a fantastic weekend! Amazing weekend and this place surely ill be my valentine’s day best place Thanks fro the Blog!